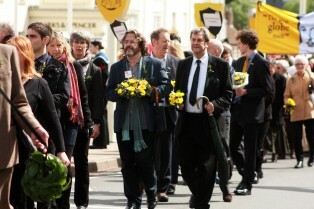 Shakespeare’s Birthday Parade is an event that everyone can enjoy as it winds its way through the centre of Stratford-upon-Avon. It passes buildings and places that were part of his life and ends where he was finally laid to rest, مقدس تثلیث کلیسیا میں, دریائے ایون کے کنارے پر. The 2019 جشن پریڈ روٹ چیپل لین سے شروع کرتے ہیں اور سمندر ی کے ساتھ ساتھ اور پل سٹریٹ اپ پرچم اسٹیشنوں کے لئے اپنی راہ بنا دے گی. پرچم لہرایا فالونگ, پریڈ ہائی سٹریٹ کے ساتھ ساتھ دور منتقل کریں گے, چیپل سٹریٹ, چرچ سٹریٹ اور پرانا ٹاؤن مقدس تثلیث چرچ میں ختم کرنے کے لئے. The Lord Lieutenant places the wreath below the bust of Shakespeare, situated in front of the dais. اس کے بعد, a drumroll will be performed by the WMFS Band and Tony Bird OBE and young achievers of the year, Ollie Cresswell and Louis Byng, بگ سالگرہ بینر فیلانا گا. Students from King Edward VI School, led by Coventry Corp of Drums, process through the arena from Waterside and will lead the procession as they proceed to Holy Trinity accompanied by the Vicar of Stratford-upon-Avon, ریورنڈ پیٹرک ٹیلر. ہم آپ کو اس موقع سے لطف اندوز امید.